Find Gray Eagle, IN Homes for sale. View Photos, Maps and MLS Data Now! Cottonwood At Gray Eagle - All new HVAC, double ovens & water heater. Award winning HSE schools. MLS#21633331. Berkshire Hathaway Home. Woods At Gray Eagle - Neighborhood amenities, close to all Geist activities - Updates galore 96% HVAC, roof 2017, AC, sump pump, hot water heater. Hurry on this one! MLS#21634837. Berkshire Hathaway Home. Woods At Gray Eagle - Laundry up, 4 large beds, 3 baths, hardwoods in hall & master bedroom, gas fireplace in master bedroom, updated master bath all in walking distance to the community pool & park. This home has it all! MLS#21629675. Keller Williams Indy Metro NE. Woods At Gray Eagle - stays! Smart home & house sound systems. MLS#21629673. Carpenter, REALTORS®. Highlands At Gray Eagle - Exterior has irrigation system, professional landscaping, outdoor up-lighting and newly refurbished hot tub. MLS#21628923. Trueblood Real Estate. Woods At Gray Eagle - WORRY FREE with New 3D Roof ('18), Ext & Int whole house paint ('18), New Furnace ('17), New H20 Heater ('17), custom window treatments, irrigation system, alarm system, radon system, sump pump w/battery back up ('13) +much more, all in award winning HSE schools. MLS#21627883. Berkshire Hathaway Home. Woods At Gray Eagle - The home is located in the Woods at Gray Eagle, a neighborhood adjacent to K-12 Hamilton Southeastern Schools least likely to be redistricted. MLS#21618349. CENTURY 21 Scheetz. 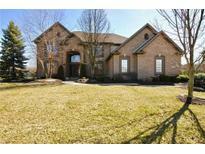 Links At Gray Eagle - Great location close to I69, schools, dining and shopping! MLS#21623266. CENTURY 21 Scheetz. Woods At Gray Eagle - Unlimited backyard fun with custom deck & mini basketball court. MLS#21615672. F.C. Tucker Company. Links At Gray Eagle - Property is conveniently located near Hamilton Town Center and downtown Fishers with all it has to offer. Welcome Home! MLS#21615482. Keller Williams Indy Metro NE. Cottonwood At Gray Eagle - The full finished (~1500 sq/ft) basement has a full bath, room for a separate exercise area, and lots of other entertainment space. Optional community pool/tennis membership available. MLS#21612810. Keller Williams Indy Metro NE. Woods At Gray Eagle - Homes selling for well over $500K! ! MLS#21607537. Realty World Indy. Cottonwood At Gray Eagle - New roof '17 & water heater '18, Hepa filter & whole house humidifier added to furnace. Optional Community pool membership available. MLS#21598811. RE/MAX Complete. Links At Gray Eagle - Large multi-level deck outside perfect for entertaining. MLS#21598260. Murphy Real Estate Group, Inc..